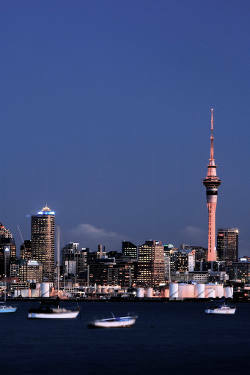 Home > Celiac Travel Blog > Is Auckland, New Zealand, celiac heaven? If you haven't been to New Zealand, you really should. I mean, it's beautiful, the people are lovely, the climate is pleasant - all those good things. But there's something else, arguably even more attractive about New Zealand: its largest city, Auckland, may have been created just for celiacs. OK, OK, maybe I'm going over the top a little. But when we spent a year in New Zealand, even back in 2002 the gluten free provision was impressive. One of their national supermarkets, Woolworths, even then was producing fresh baked gluten free bread on the premises twice a week. There was regularly gluten free cakes in coffee shops and many restaurants catered for celiacs. But the icing on the cake, the crowning glory, the place where I virtually lived for 3 months of our stay was Marx Bakery in Auckland. It's a gluten free bakery. Yes indeed. They don't make anything with gluten in it. (I know you know what gluten free means, but it's just so gobsmacking I had to spell it out). But now, not content with gluten free bakery nirvana, Auckland has gone and got itself a gluten free grocery too! If you needed a reason to visit New Zealand, other than the fact that it's bloody lovely, now you've got one.